Sam Brown is back and keen to help AFC Rushden & Diamonds make an impact in their new surroundings this season. The left-back, who joined Diamonds when their senior side was formed in 2012, played a key role during the first half of the last campaign before leaving the country to travel the world. 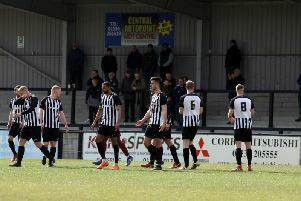 Diamonds went on to miss out on promotion from the Evo-Stik Southern League Division One Central when they lost 2-1 to St Ives Town in the play-off final in May. Since then, Andy Peaks’ team have been switched into the Evo-Stik Northern Premier League Division One South, which gets under way this weekend with a trip to Newcastle Town. Brown returned to the country during the summer and immediately rejoined the club where he will be looking to add to his 158 appearances. “I’m really looking forward to the start of the season now,” the defender said. “I have been getting back into it after not playing football for a while. “There have been a few players coming and going during pre-season but I think we have prepared pretty well. “There are going to be some strong clubs in the division while there will also be some who are a bit unknown as far as we are concerned. Brown was disappointed to see his club just miss out on promotion back in May. And even though it was something of a drag to return to these shores after his trip abroad, he is pleased to be back at the Dog & Duck. “The team were in a good position when I left and it was disappointing to see that they just missed out on promotion in the play-offs,” he added. “I am glad to be back at the club and I am looking forward to playing again.